The entire season is reviewed in an ultimate catch-up guide. Click on an episode title to be taken to the review of the episode. Well Heathens, let's pound the witch drums one final time. It's Black Sunday, and with it, the very final episode of Salem. To say I am overcome with grief would be an understatement and I had so many feels during this episode. It took me a while to take the courage to play the episode, knowing that it would be over in 48 minutes. But, my fellow witches, I am genuinely happy with how the finale turned out (despite some minor things I will discuss in this review), and more importantly, the entire Salem saga from start to finish. 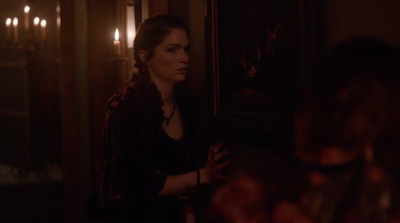 I seem to always struggle with where to start when it comes to Salem these days due to the amount of story and action that occurs within a single episode. 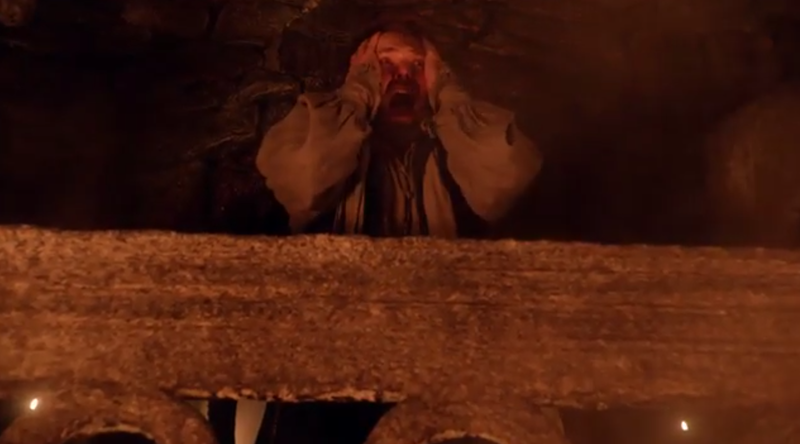 The penultimate episode ended with Anne opening the door to Hell, instantly resurrecting the Devil inside the Frankenstein's Monster-like body of little John. I know a lot of people were stunned and that one action of opening the door caused many fans' hearts to palpitate. Fortunately we got to see exactly what happened next, like the second part of a mega-finale where the intensity of the approaching Black Sunday just continues. There are still minutes to spare before midnight, the witching hour where everything happens, so there is still time for things to change. John is still working on stopping the Red Mercury from killing all of Salem, but major problem - Sebastian has switched sides, so he can't even rely on his own complex nemesis to Mary's heart anymore. The fight between John and Sebastian, much like John's fight with the Sentinel, is brutal. I've also noticed that John is getting himself into a lot of physical fights lately, I mean we could almost paint him as some kind of wild, violent man if we didn't know him better. Sebastian probably shouldn't have told him that he failed to change Mary's heart, and should have kept trying to ruin his love for Mary, but I guess his confession also helped get John and Mary back together again. Mixed feelings about Sebastian at the minute. I've always felt fairly sorry for Sebastian to be caught in a love story he was never going to win, so when John fatally stabs him in the neck (surprising moment), and Sebastian reveals his motives that we really knew all along, it did humanise him somewhat. It wasn't to the same impact of the Sentinel though, but still, he died on the cusp of the side of good and evil, where Mary really was his only tie to his humanity. With the Devil being back in Little John's stitched-up body, I did not expect a fully grown man to come out of him. I really enjoyed the performance of the adult Devil, even if it was mainly in relation to getting his mother in bed. The scene in the hallway, after Anne fetches Cotton, was truly a highlight of the episode. I'm going to say it now, but Anne stole the show in this finale. She has been groomed to the dark side for a long time now, but the confrontation with Cotton in the previous episode completely broke her. What a life-changing event to occur as so much could have been avoided had Cotton not seen Gloriana. But, after being trapped in the mirror, Anne releases him and takes him to the Devil. 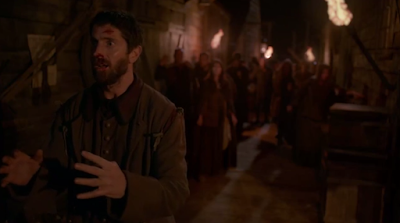 He is given a choice that will save all of the souls in Salem - he willingly sacrifices his soul by stepping through the door into Hell, or Salem will be vaporised. 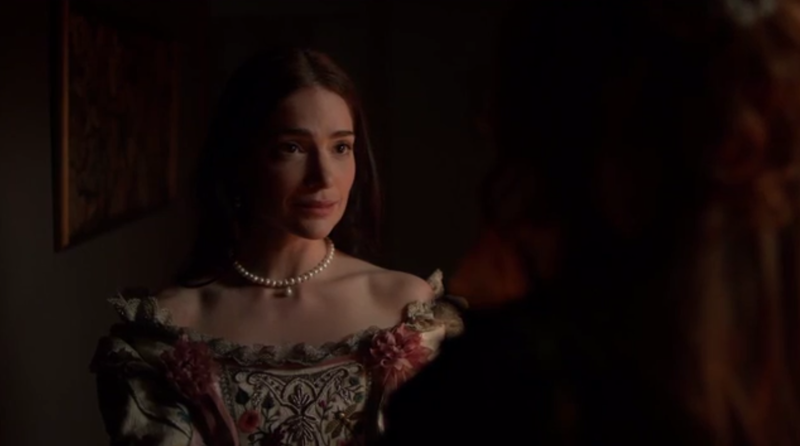 Gloriana was an incentive as Cotton wanted to save her, and Anne taunts him to no end. I can't believe that Cotton would be a casualty pretty early on in the episode. If anything, it revved up the ante to a billion before most of the action could even occur. I expected Cotton, the good soul that he is, to survive and maybe live happily with Gloriana. Oh no. If anything, this finale was definitely true to the tone of the show - that bleak, deliciously-evil tone that made me fall in love with this show in the beginning. Out of everyone who perished or were doomed, Cotton got the best "end". His willing sacrifice elevated his status as a hero, staying true to the innate goodness and rejection to kneel before Evil. 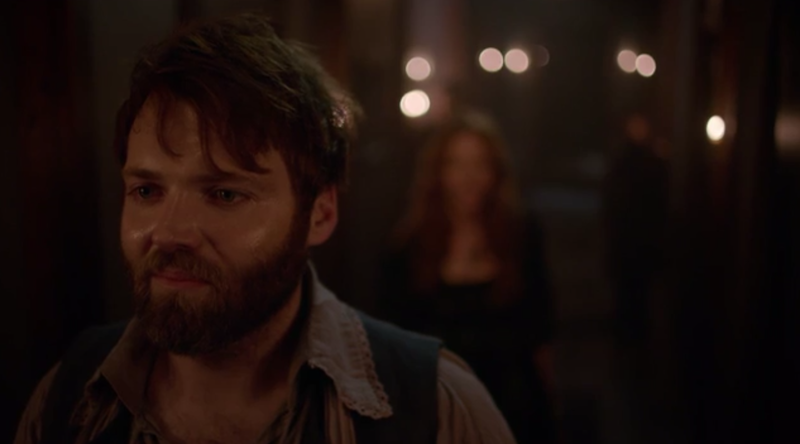 Fair enough, he gave Anne exactly what she wanted, but he saved everyone in Salem in the process AND he delivered some of the best burns of the series. He went down swinging and got a few punches in, and if anything, he has left a long-lasting effect on Anne. Anne. From heroine to villain, I feel like, along with Mary, she has had such a transformation of character over the course of three seasons. The sacrifice of Cotton was only the start of a domino effect of the terror Anne subjects the others to. As much as Mary is always my ultimate bae, she herself sat this one mainly on the sidelines as opposed to the adventuring, sinister Anne. I cannot begin to fathom the complexities of her evil. Poor Mary becomes subjected to a bodily takeover by the Countess Marburg, something that was planted a few episodes before and something Sebastian had been working on all season. Trust Anne to do a man's job in one single day. I've been looking forward to the return of the Countess all season, the addition of Lucy Lawless' voice in various episodes were always a pleasure to listen to. I cannot begin to express how much I loved it when the Countess embodied Mary. I could not get over the moment the Countess began speaking through Mary - Janet Montgomery did a fantastic job in carrying this performance with the mannerisms and even way she delivered her lines. I could just picture Lucy Lawless whenever Mary would talk, and the ways she would smile and throw a look and you'd have to think about what she is thinking. It was beautiful. It gave me life. It was such good timing, too, when John finds Mary in bed, allowing them some time to talk and for Mary to tell him what Anne and the Countess had done to her, just before biting his earlobe off. Ouch. The love between them was definitely felt before the biting incident, and it was very necessary for the switch of bodies due to the Essex tree keeping Mary grounded in Salem - yet with Mary in the Countess' body and vice versa, Anne, surprisingly, gave John and Mary the happy ending they so desperately wanted. They are able to leave Salem, something they've wanted for such a long time. I will discuss this scene more later, first I want to revel in the evil things Anne did. So 'Mary' and the Devil need to consummate if she is going to be his bride, and how weird it was to have Anne walk in and watch and seem, for a moment, to participate, just before bringing the knife down on the Devil. Not just any knife, but the angel-killing knife. It was a very easy death of this new Devil, which surprised me and I didn't think it would be 'over' just like that. Of course, the Countess was not at all pleased, but then she saw the murderous evil glimmering in her daughter's eye, and instantly she knew she made a mistake to question Anne. How quickly every other witch in Salem loses any kind of power or will against Anne - she is legit the ultimate force, no questions asked. Nobody can stand up to her. The poor Countess, finally getting what she wants after such a long, long time, now suffers to death at the hands of her daughter. Anne has had a taste for power and she wants it all. Now she wants to be the Devil's bride - so she's going back to the beginning by birthing him, and then will finally release him from Hell so they can rule the world together. So much effort to get him here to begin with and Anne gets rid of all that hard work in one fell swoop. 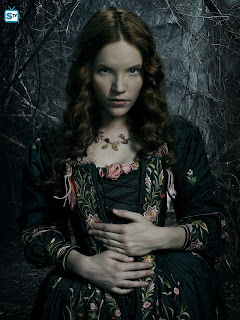 But at the same time comes Anne's violent reign in Salem. There can be no one to challenge her, no witch left in Salem that could overthrow her. It seemed like she was extending a lifeline to Isaac, another good soul like Cotton who stays true to his self. I am glad Mercy let him go, as much as it pained her, but it allowed him to reunite with Dorcas. But only briefly. 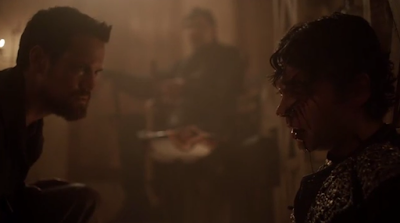 Anne reveals herself to him, and Isaac is disappointed. I don't blame him if he has trust issues - everyone seems to be a witch these days, it's all the craze. I liked that Salem was basically destroying itself without the need of Red Mercury, and poor Isaac couldn't stop them. But Anne tells him he would make a better leader than Hathorne, but Isaac rejects any kind of power. He has seen how it corrupts, as it has done Anne, and the all-wise fornicator has shown explicitly the reason why he is yet another hero in Salem. Like Cotton, he chooses the right path, not the easy one. And poor Mercy. I actually was expecting her to ditch Hathorne at the first sign of trouble, when he would be only a hindrance to her. But, surprisingly, the speeches of love and the showcasing of such powerful emotion proves that Mercy had, sort of, reformed in the end. I'll always be rather surprised at the love connection of Hathorne and Mercy, how sudden it kind of was, and how quickly they married and, ultimately, died for each other. I have to hand it to Elise Eberle, she gave a powerhouse performance when Anne started choking Hathorne. What a cruel, awful thing to have to witness when Mercy has already declared that all she wants is to love and have love in return - and she's finally found it. For Anne to take that from her, well, it only furthered Anne's moral descent. It's so painful to watch Hathorne choking in the air as if on some invisible noose, and then for Anne to allow Mercy to join him in death... there are no words. As problematic as Mercy has been, and how removed she has been from the main plot, it's still an awful way to go. Great, though, because it was a phenomenal scene, but still so awful for her. I know people weren't the biggest fan of Mercy this season, but you would have to be pretty heartless to have not felt something for her in her final moments. But one thing I am very disappointed with, in all honesty, is what happened to Tituba in this finale. She did nothing. I mean, nothing. Her appearance was so brief and it was over so quickly that her ultimate fate, mouthless in a cage on a ship in the middle of the sea, is like a perfect metaphor to how her character was in the series finale. After how important Tituba has been in the past, and even in this season in stitching back up the body of little John, there was no agency at all here. She was just as powerless as Mary, Mercy, and everyone else. As a seer, she did a very poor job in seeing, well, anything. She had so many possibilities, she could have been a faux-villain to Mary and the others and could have turned out to be on their side, but instead, she got absolutely nowhere and nothing in return. Only solace is that she's not dead, but her fate is so undeserving of such an influential character in the show that I do have a bit of a sour taste when recollecting her 2 minute screen-time. Why couldn't she have done more or said more? Fight back! I wanted her to go out with a bang, not a whimper. I guess the only happy endings were reserved for Mary, John, and Anne. I love that Mary got to be happy - she really, really deserves it - but it's also bittersweet at the same time. She's lost her friends, including Isaac, who is absent for the scene at the end at the church. The sun is shining, it's a day we never thought we'd see in Salem, it's almost like life can continue with no worries. Never the case with Salem - there is always more, something under the surface to ensure that nothing can ever truly be happy. Anne has assumed the role of Cotton as speaker to the people, the guiding light of hope for the future of the town. She's a little honest with them in revealing the true villains that tried to bring Salem down were witches on the inside - but plays the ultimate deception game. Fortunately, we have little Dorcas there, who may grow up to take Anne down - but Isaac is absent. I doubt Dorcas would have been there without him, so I'm sure he'll be dead. Anne would not have let him live otherwise as he knows way too much about her. 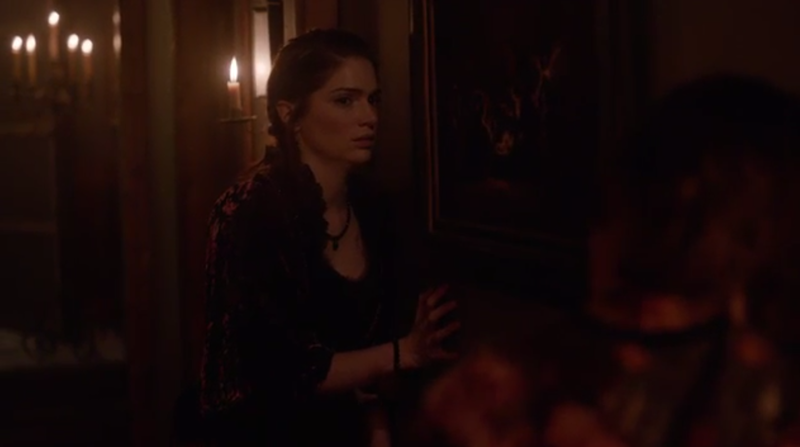 Anne is going to be rule Salem, give birth to the future Lucifer, and do it all again. Will she succeed? Without Mary and our other heroes in the picture, she just might. Loved the zooming in on her face in the Sibley house, with the music intensifying as it closes in and she looks at the camera. Oof. Amazing. 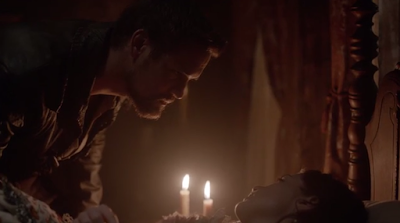 And the very final scene of Salem? Evil. Beautifully evil! I was shouting at Cotton to run back up those stairs and to go no further, but he had to see what he had gotten himself into. I didn't think we would go back to him after losing him before the 20 minute mark of the finale, but it was a pleasant surprise. I love the look of Hell! It looks awful and amazing. It's interesting they would introduce this as the very final scene of Salem - the screaming, the fire, the white noise, Cotton screaming. The good has lost. Evil has won. And now we know Cotton is burning forever in Hell, and that Anne is reigning supreme. It's so unsettling to end on that image, but in all honesty, for this type of show, I wouldn't have wanted it to end any other way. Amazing. Incredible. A final, triumphant hour of Salem that will forever please and unsettle me when I recollect this show for years to come. While I would have preferred a bit more for characters such as Tituba, and for Mary to have had a bit more agency, I am so impressed with how this series finale turned out. So, so many brilliant scenes - highlighting the sacrifice of Cotton and the Countess taking over Mary's body - amongst the deliciously evil rise of Anne. Mary went from villain to heroine in the course of the show, while Anne went from heroine to villain. We should have seen this coming, but I for one am so shocked by her actions, and yet I loved every minute. I enjoy the fact that we got an ending for our Mary, so in effect, the show can end with her, but we also have this sense of another dawn in Salem - a possible continuation, perhaps even darker than the first. Best Witch: Anne Hale/Marburg. She stole the show actually. Best Gentleman: Cotton Mather. His ultimate sacrifice was very noble. Most Bewitching Chemistry: Mary and John. Best Moment: I don't think I can really pick. The entire segment of Anne going on her rampage, killing Mercy and Hathorne, damning Tituba, visiting Isaac, and killing her mother. And Cotton sacrificing himself, Anne at the end. Oh my God, just everything. 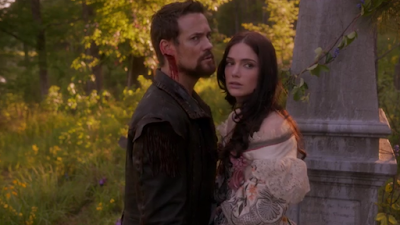 Best Romantic Moment: John and Mary walk away from Salem to begin a new life together. Most Sickening Moment: When the new form of the Devil comes out from Little John's body. Creepiest Moment: Cotton at the end, in Hell. We made it here. While we would love more, a season four and beyond, we instead got a complete 36-episode story, a beginning, middle and end, and we should definitely count ourselves lucky. A lot of shows have been cancelled long before their time, sometimes without warning so they couldn't wrap things up. WGN America allowed the writers of the show to deliver to us fans the final chapter we deserved. I cannot thank them enough. I've had my heart broken in the past with cancellations of some of my favourite shows (I will never get over Witches of East End), but it proves that we had a network, a crew and a cast dedicated to giving the fans a story we could follow and love. I am sad I won't be posting regular reviews of Salem anymore. I want to thank absolutely everyone who has followed the reviews for the past 2 years, since I joined SpoilerTV in August 2014 and took over reviewing the show from the start of season 2. 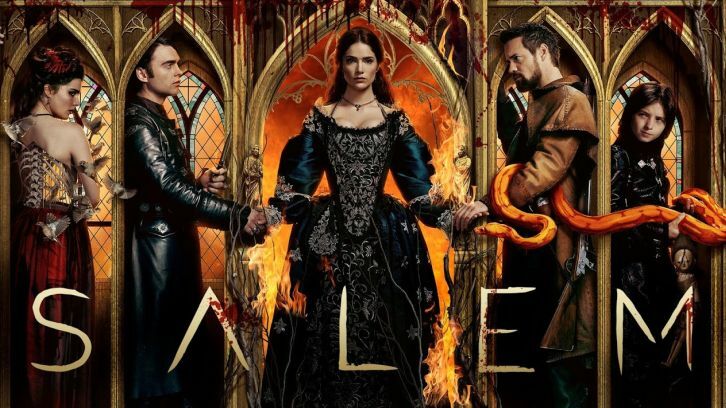 I have enjoyed being able to discuss everything about this show with all of you, so thank you, from the bottom of my heart, for enriching my experience of Salem by sharing your thoughts on the show and my reviews. In the future, I do want to do a complete Salem review, from season one through three, as a sort of series retrospective. 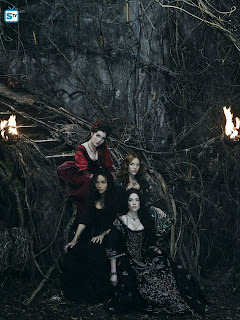 My love for this show knows no bounds, and I want Salem to live on forever for the loyal Heathens. Usually I leave a promo for the next episode at the end of my reviews, but since there shall be no more episodes, I will leave the video for the first ever teaser trailer for Salem, released December 2013 on YouTube, and the iconic opening credits. That's it. That was the final ever episode of Salem. No new episode airing next week, but don't be too sad about it (though my heart is still breaking). Let me know your thoughts on the final episode, and don't forget to share your love of the series for it will continue to thrive in our hearts for years and years to come.